So, I saw this today at Target. 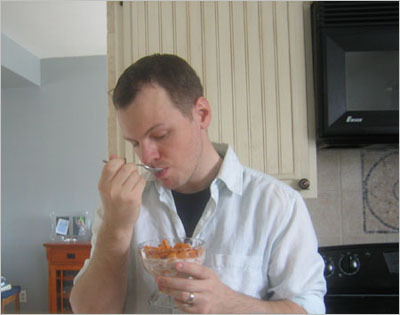 In a recent study, cereal was determined to be the best food ever created. This study was done in my house, when no one else was home, but I think its results are still valid. 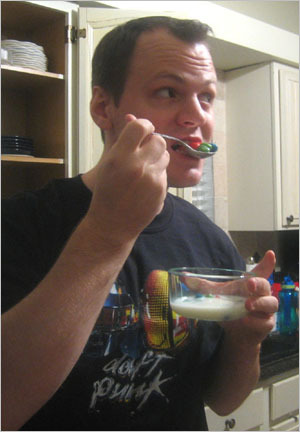 Cereal makes up 30-40% of my daily caloric intake, and is responsible for at least two of my daily servings of froot. Sure, compressed flour and sugar make for great cereal. My question was, what else would make for great cereal? And even more interesting: what would make for terrible cereal? The timing was perfect for this experiment. 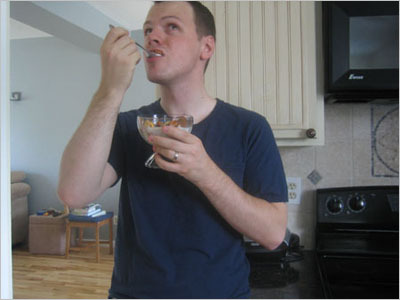 My wife was going out of town for the weekend, so I could see what it would be like to spend three straight days by myself, eating nothing but insane cereals. I don’t know what that says about me, when I have a weekend to myself, and my first instinct is “Time for cereal!” I personally think it says something awesome. The experiment starts where most work weeks should: Friday. 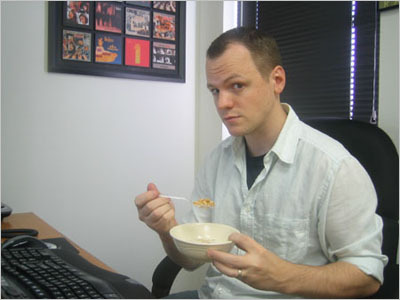 Despite my love for it, I rarely eat cereal in the morning. Usually I’m too sleepy to go to that incredible effort, so my usual breakfast consists of a granola bar, Fruit Roll Ups, and soda. Even more than cereal, the best food to have for breakfast (notice I said “for,” not “with”) is bacon. However, going to the effort of cooking it is way too much work, not to mention the hazards of spattering grease. So, I went for the next best thing: bacon bits. 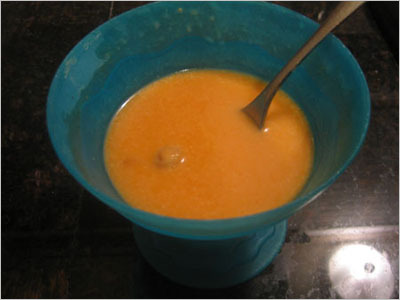 I poured a nice big bowl, added the milk, and dug in. 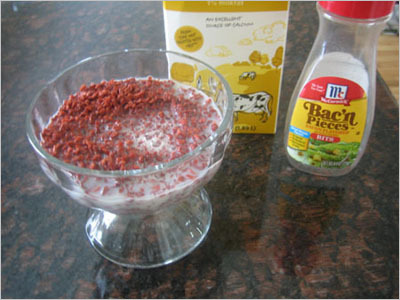 At first, the bacon bits appeared like they could pull off their role as cereal; they even looked like flesh-colored Grape Nuts. 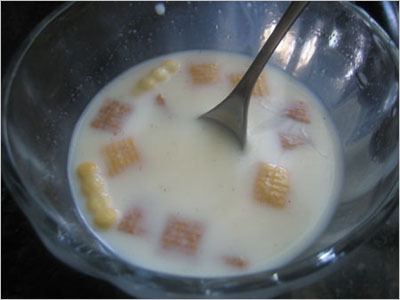 However, their ability to stay crunchy in milk was non-existent. Within seconds, the Bac’n Pieces had turned to Bac’n Mush. 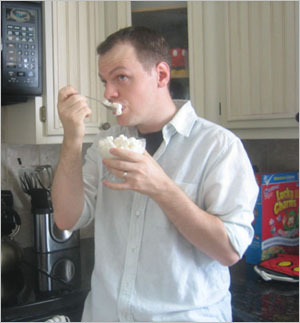 It essentially became a cold, meaty oatmeal. Wilford Brimley would not approve. The pervasive, smoky meat flavor didn’t make for the most pleasant milk-drinking. 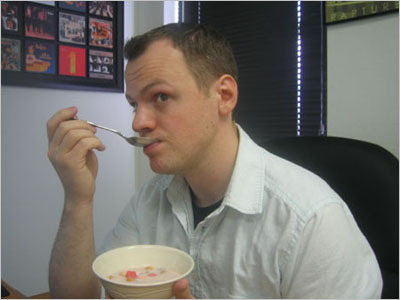 The flavor a cereal gives the milk is always an important factor, and bacon bits just did not work. I know making things bacon-flavored is all the rage right now, but bacon milk is something I don’t see catching on. For lunch, I decided to stick with the high-protein theme. I thought pork rinds might work better as a cereal, but keep in mind this is in comparison to bacon, so it’s possible. They misspell “bacon” to include the word “bake,” yet they’re fried. I’m confused. 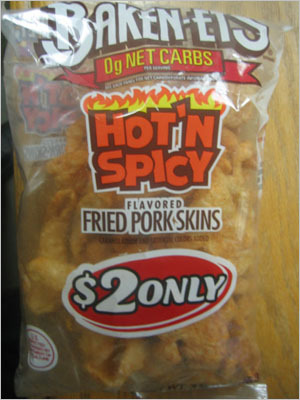 I had never eaten pork rinds before, since, well, they’re the fried skin of a pig. However, I thought their puffy and crispy texture would make them an ideal candidate for making the switch from bag to bowl. Squeal like a pig, cereal! Boy, was I wrong. It can now safely be said that dried or puffed meats just don’t work as cereal. 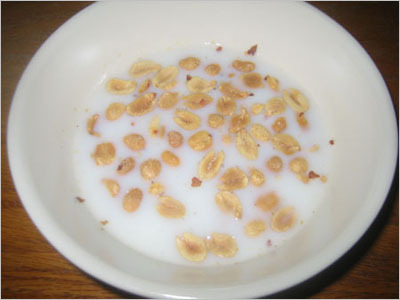 When in the milk, they kept their puffy shape, but any semblance of crispiness was gone. They took on the horrifying texture of a firm interior surrounded by mushy slime. Also, they were flavored like spicy pig. While it would be easy to make a cartoon spokesanimal for a spicy pork rind cereal (a pig in a devil costume, holding a spoon instead of a pitchfork — you’re welcome, ad agencies), the actual cereal probably wouldn’t sell very well. Maybe if Atkins was still popular. After all that meat, I thought it might be a nice idea to get in a serving of vegetables. Officially endorsed by Asian Monopoly Man. 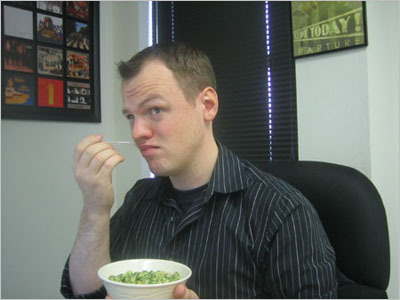 Wasabi peas are one of my favorite work snacks, since they’re one of the less nutritionally-terrible things I eat. 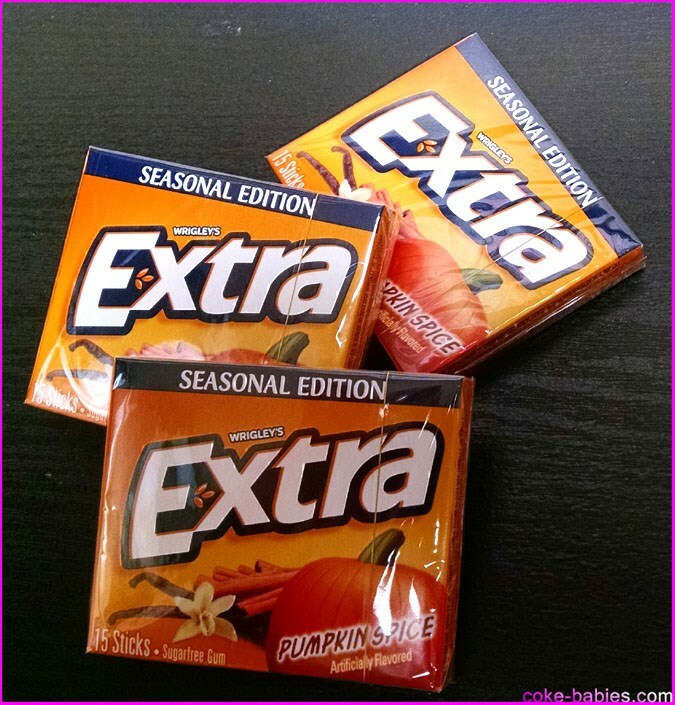 I can eat a ton of them pretty mindlessly, and my body tells me when to stop, in the form of a violent, burning stomachache. Since they’re very crispy, I thought they would hold up to milk. And their shape is very cereal-esque. At first, things were going well. The peas were staying crunchy, and the milk did a good job of keeping the wasabi from being too overwhelming. It actually stayed pretty crunchy throughout the whole bowl, although the flavor did seem to get a bit washed out as it went along. I found out the reason for this when I drank the resulting milk. 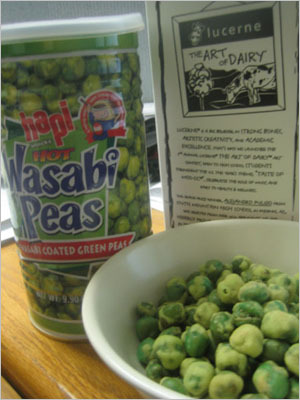 The milk was slowly washing the wasabi coating off the peas. 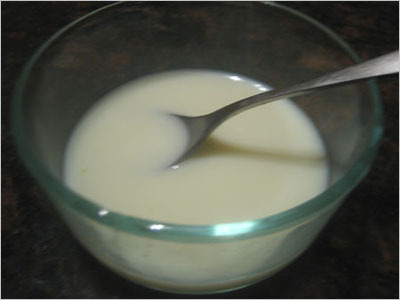 Therefore, the milk had turned into, basically, liquid wasabi. So that wasn’t too pleasant. Later in the day, I decided to have something sweet. I already had a serving of vegetables, now it was time for a serving of fruit. I thought Skittles would hold up to the milk well, since their shell would protect them. 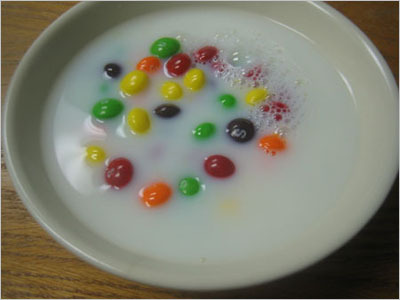 But within minutes, the milk was washing all of the dye off the Skittles, leaving them a rather unappealing grayish-tan. Instead of staying their usual, chewy texture, the cold milk had turned them rock-hard. So every bite was a form of exercise (an added bonus), struggling through the near-impenetrable shell to get to the now incredibly tough interior. I have absolutely no idea what those white specks are. Maybe the S’s washed off. On the bright side, the resulting milk was pretty good. 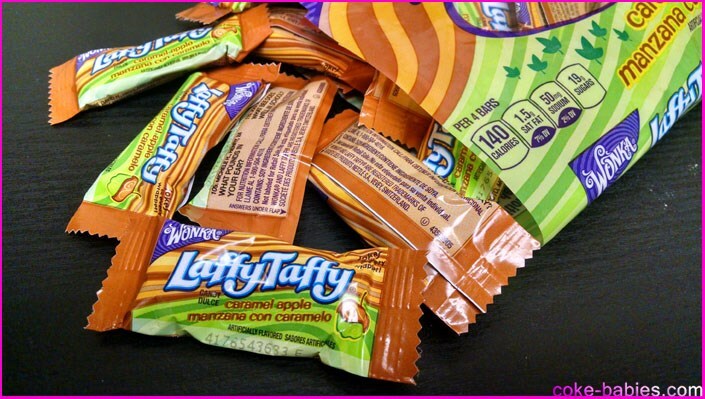 It tasted like they took a big bag of the artificial flavoring from Trix, and used about eighty times the recommended amount. Since I never plan ahead for anything, I hadn’t planned what I would have for dinner. Which is why I wound up eating more peas. Instead of wasabi, these were sriracha peas. Sriracha is a Thai chile sauce that people often use on cooking shows, because if no one knows what it is, it must taste good. When turned into cereal, the peas didn’t fare very well. 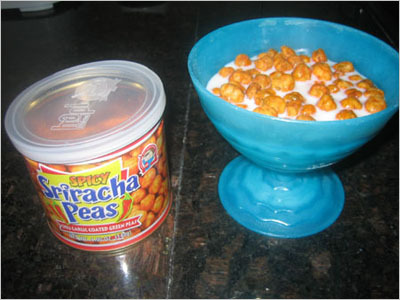 Unlike the wasabi peas, which sort of worked, the sriracha peas tasted disgusting in milk. The spiciness of the sriracha became diluted, and the flavoring turned into something more like ketchup. 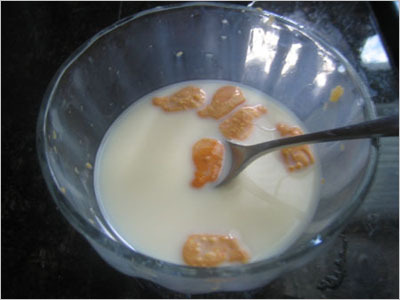 What made this even worse was I knew that after finishing the cereal, I would still have to contend with the milk. I was right to be afraid, since the resulting milk was simply horrid. It tasted like the hellspawn of cheap cocktail sauce and Spaghetti-O’s. I started the day with a food that seemed to have a good blend of cerealish qualities, but still had the savory aspect of an IHOP pigout (minus the pig). Cheddar Whales are the mutant offspring of Goldfish crackers and Cheez-Its. Try not to ponder the actual reproduction process that would lead to them. It’s not pleasant. Surprisingly, the whales got soggy almost immediately, though you would assume whales would have better natural protection from liquid. The cheese flavor didn’t taste as good in milk as you would think (I’m assuming you would think it would taste delicious). The resulting milk was surprising. I was expecting the orange to wash off into the milk more, but instead the milk was just a vaguely unsettling orange-tan. What wasn’t surprising was that it had a mildly unpleasant cheese flavor. I was expecting that part. The Cheddar Whales alone wouldn’t cut it. Breakfast without large amounts of sugar seems un-American. 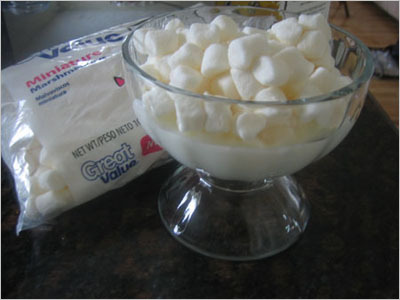 I realized what my morning cereal was missing: marshmallows! Now with 0% oat pieces! I don’t think they sell those dry, powdery marshmallows that come in cereal or packets of hot chocolate, so I had to substitute regular mini-marshmallows. The marshmallows were hit or miss. 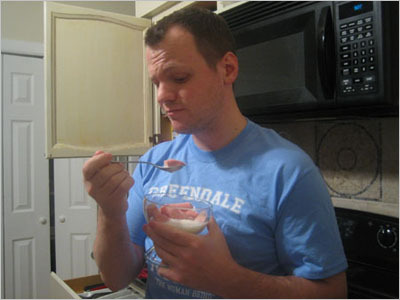 They were almost impossible to eat, as the milk glued them together into a gigantic mass. 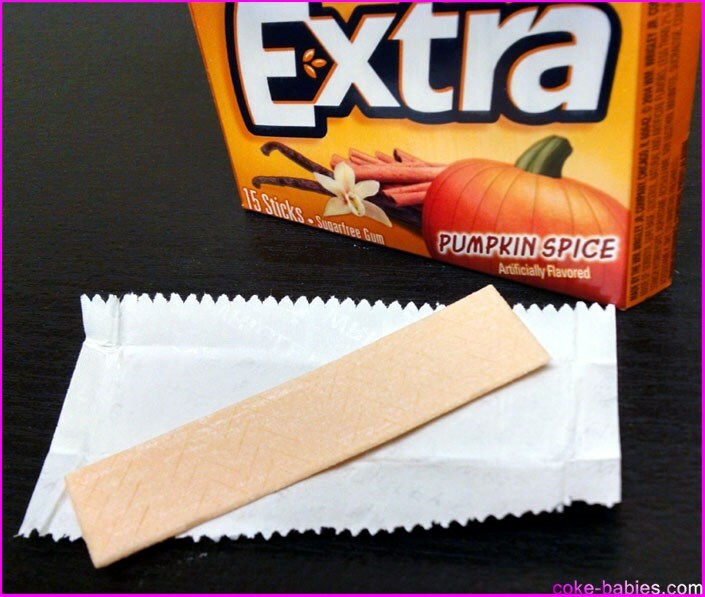 But they did provide two of the recommended servings of sugar, without any artificial dyes! So when you think about it, it’s actually quite healthy. I think Kashi is really missing an opportunity here. 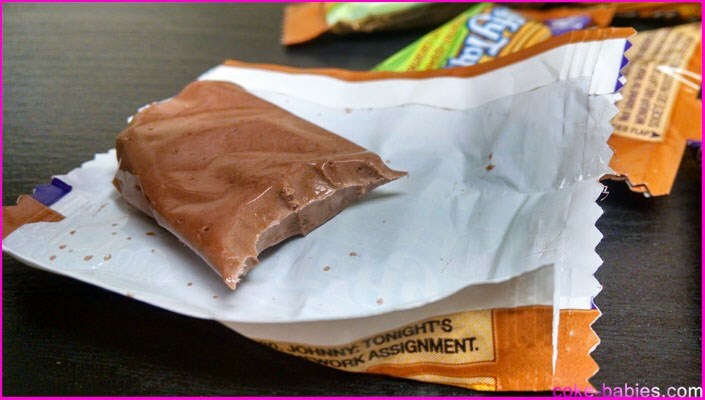 Resulting Milk Flavor: Like chocolate milk, without the chocolate. I had gotten hungry sooner than expected, which was surprising due to my hearty breakfast. Going for something with a bit more protein, I decided on a bag of peanuts. Like the Skittles, the cold milk turned the peanuts rock hard. This is probably the second hardest cereal I’ve ever eaten, trailing only Grape Nuts. Seriously, how do people physically eat those? The milk washed all the salt off the peanuts, so the peanuts themselves were rather bland. 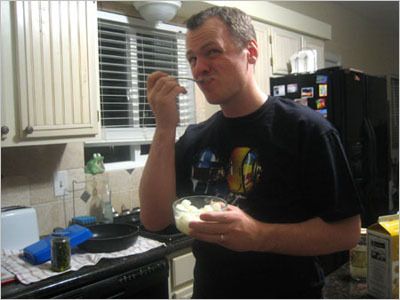 The resulting salt milk was, well, like drinking a bowl full of sea water. But with more calcium. 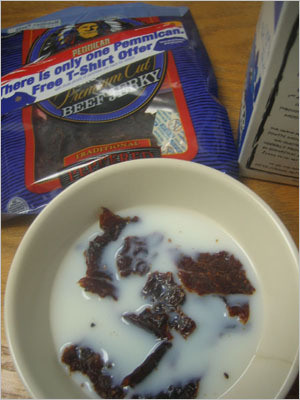 Since beef jerky is dehydrated beef, adding liquid should result in just beef, correct? I’d love a beef jerky T-shirt, but it would go to waste since I don’t go to enough gala ballroom events. 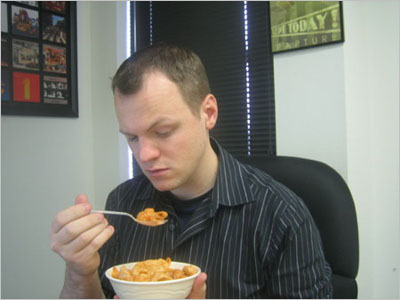 Most likely for the same reason cold water plus pasta doesn’t make edible pasta, this did not result in a delicious beef stew. 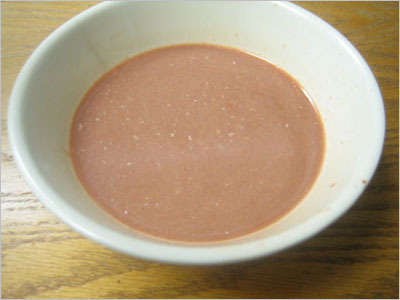 Due to the cheap pieces of meat, and the beef flavor washing into the milk to create a strange gravy, the whole dish became unfortunately similar to cat food. I should mention I am only assuming this is what cat food tastes like. I have eaten Frosty Paws before, but that is as far as it’s gone. Saturday’s cereals had not been going well, and I really needed a win. 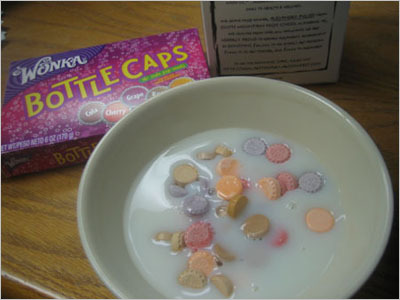 So I went with something I had long thought would work well as a cereal: Bottle Caps. They had a cereal-y size and texture, and the flavor would be similar to Froot Loops. I was right. This was awesome. Even though I’m still mad at Wonka for changing the shape of Bottle Caps (they’re no longer cap-shaped with the indentation, just flat circles), these worked perfectly. 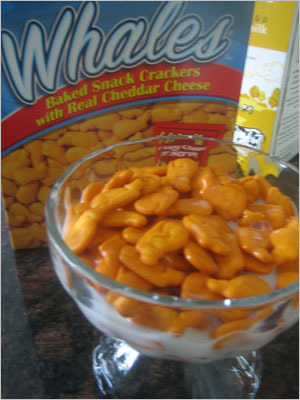 They stayed crunchy, but not too crunchy, and they actually worked well with the milk. Since most of the soda flavors would pair well with milk anyway (grape not so much), overall it meshed nicely. As for the resulting milk: holy crap. It tasted like the undiluted syrup they use in soda fountains to make Hi-C. 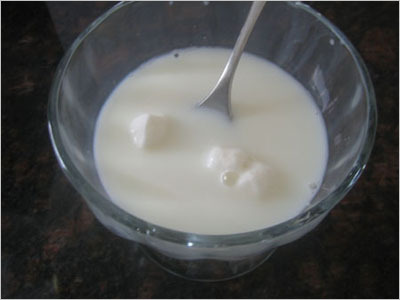 Resulting Milk Flavor: Pure liquid sugar and froot. For dinner, I thought I should have something more substantial. But what I had available was truly distressing. 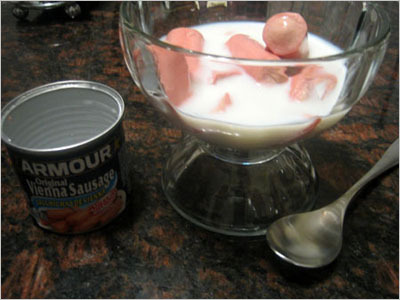 To me, Vienna Sausages are one the most revolting foods imaginable. 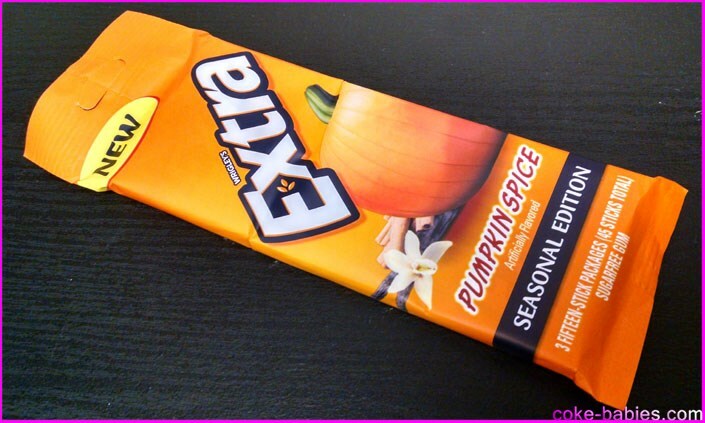 I’ve never actually eaten one, but I have smelled them, and that’s enough. Opening the can, I was met with the horrid little pink tubes. It’s like in a horror movie when they find a victim in a barrel, their rotting corpse suspended in rank liquid. Except the corpse would probably smell and taste better. That may seem like a bold statement, but have you ever eaten a Vienna Sausage? Jeez, they were AWFUL. I think the milk actually helped at first, because it washed off the horrid brine, leaving me with basically cold, wet, uncooked hot dogs. Except not as appetizing as that sounds. Granted, Chex Mix isn’t thought of as a cereal. Sure, it has cereal in it, but it also has pretzels, bagel chips, and those weird curvy cylinders that no one likes. From my last visit to the supermarket, I would estimate that there are currently nine hundred varieties of Chex Mix. I went with Bold Party Mix, because it seemed like the most up-the-middle in terms of savory flavor. As a cereal, this worked beautifully. It was a bit confusing when I got a spoonful with a giant bagel chip, but I persevered and figured out how to eat those as well. I’m sorry, I don’t mean to brag. Considering it was bold and savory, it actually tasted pretty good. 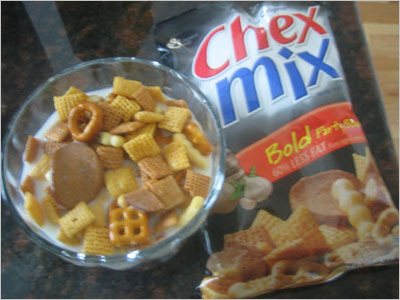 The texture held up to the milk, and while the milk wasn’t a hidden gem unleashing Chex Mix’s true potential, it also didn’t make it disgusting. Which, at this point, is something I will consider a victory. 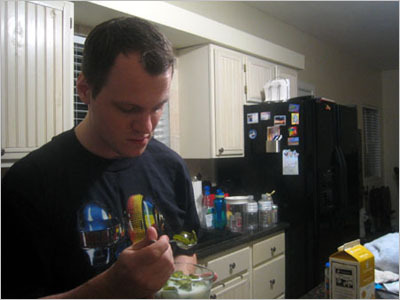 The weekend’s experiments had killed off my appetite, so I wound up not eating anything for about eight hours. Even though meat would never work as a cereal, I couldn’t give up on all savory items. The dried peas didn’t work too well, but what about wet vegetables? Cocktail onions seemed like a good choice. Well, they seemed like they would work because they were small and round. In retrospect, everything else about them made this a horrible idea. I drained them first, since the onion juice would throw off the milk, and make all of my exhaustively researched data null and void. As a cereal, the texture was just awful. They obviously weren’t crunchy, but they had this awful, eyeball-like consistency. The onions themselves weren’t too bad. Since I think they are pickled in some way, their flavor is much more mild than your standard onion. Although here is the fact that they are still onions. The milk was a different story. A story filled with sadness and betrayal. It was just onion brine, thickened with milk. Like a really thin, strong onion dip smoothie. Multiple parts of my body were angry with me at this point: stomach, nose, mouth, eyes. I felt like George Costanza eating the raw onion, except I didn’t even get a dime. 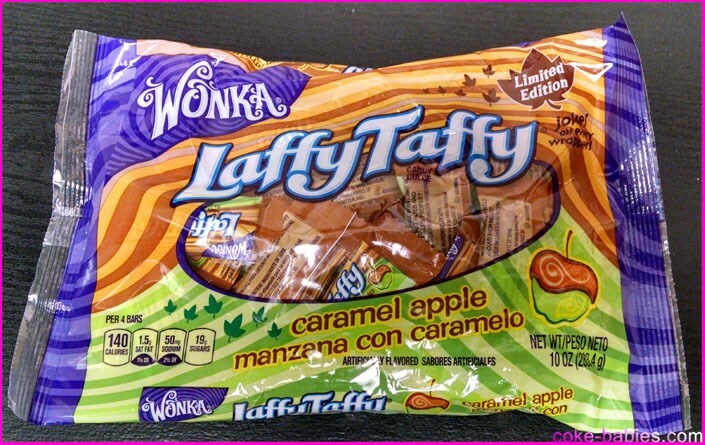 Resulting Milk Flavor: Would saying REALLY ONIONY be too obvious? 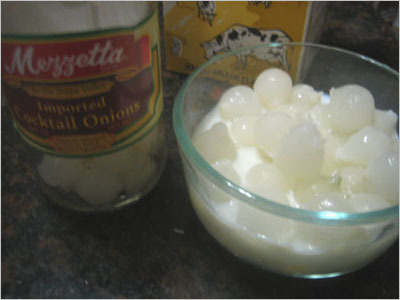 My stomach was none too happy with my decision to eat onions and drink their milk. So my next experiment would stay in the vegetable family, drowning out the onion burning with an even worse burning sensation. Jalapeno slices seemed like they’d be a great fit on the spoon. This proved to not be entirely accurate, since the small, uniform slices on the wrapper didn’t exactly show up in the jar. The slices were different shades of green and different versions of round. These jalapenos did not have the same father. I don’t know if I had just been so beaten down by this weekend that the concept of something being not disgusting was enough to be considered “good,” but the jalapenos were surprisingly good. The texture wasn’t crunchy, of course, but they did have enough snap where it didn’t feel like a spoonful of mush. 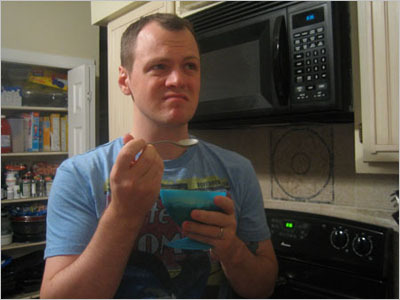 And I will surely never get a job writing as a food critic when I admit that the jalapeno flavor went really well with the milk. The milk itself, that didn’t work so well. It didn’t take on any jalapeno flavor, it was just very spicy. I don’t think the formatting on this site will allow me to express “very” in the way it deserves, so just imagine that word “very” in font size 56. The taste was like pure capsaicin. 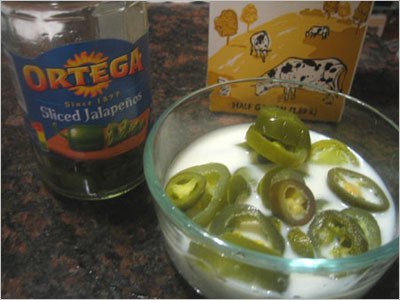 Normally, jarred jalapenos aren’t that bad, but I guess the entire jar had enough spiciness to soak into the milk to make it a force to be afraid of. 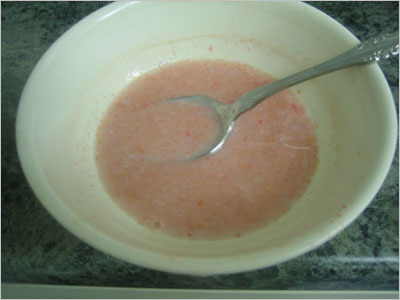 Although when I can say “The jalapeno cereal was good, although the milk wasn’t very delicious,” I will take that as a success, no questions asked. 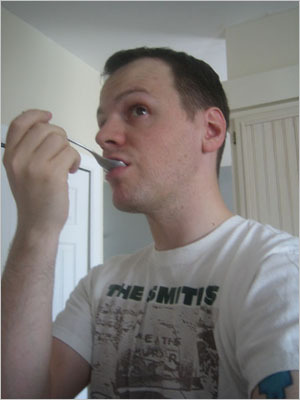 For my last cereal of the experiment, I wanted to go out with something that I thought would taste really good. The cereal would be made from Gushers. 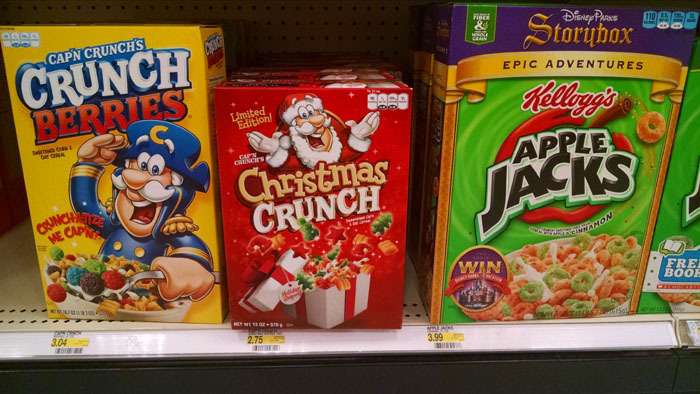 As an added bonus, this could be the most meta cereal ever created. It’s a cereal, submerged in liquid, while filled with liquid. Don’t worry, I’ll wait while you clean up the mess, since I just blew your mind. This idea made me think of other cereals along the same lines. I hope to see a Boston Kreme Donut cereal as soon as possible. The Gushers themselves, unfortunately, didn’t work too well. As soon as they hit the cold milk, they turned rock hard and stuck together. So my thirty or so individual Gushers turned into three large icebergs. The taste was still good, while the actual eating was a confusing experience. 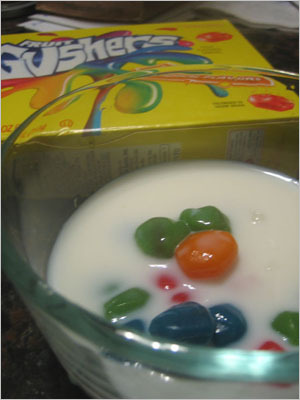 There would be a chunk of Gushers in a mouthful of milk, but when I bit into them they exploded, like underwater mines. The taste and texture of the fruit snack was sufficiently awesome enough to make this an overall success. The milk tasted mostly like what you’d expect. 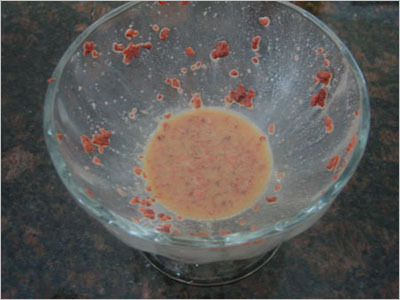 A mix of milk, fruit snack surface sugar, and the liquid that leaked out of the Gushers, like fruity underwater oil wells. 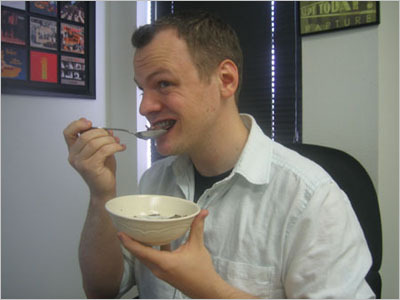 Despite this weekend’s events, I still love cereal. This isn’t like when you catch your kid smoking, and make him smoke two full packs to make him hate the flavor for the rest of his life. While I won’t be filling my days with Caesar Salad or Curry Chicken Cereal, I will never abandon the food that made me what I am today. Although come to think of it, that really doesn’t say much for cereal.